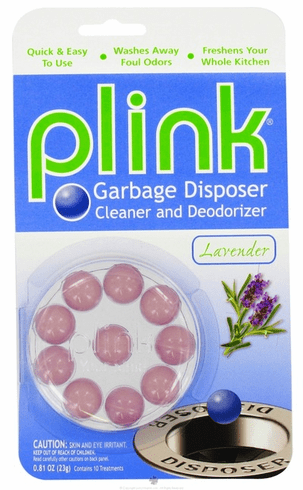 Phelps Industries Plink Garbage Disposal Cleaner and Deodorizer Lavender is an effective, economical way to freshen your disposer and keep it odor free. Plink is biodegradable and safe for all disposers and pipes.ÊPlink cleans your garbage disposal & helps prevent clogging. Drop in a Plink tab, turn on the water and disposal, and it goes right to work, breaking up smelly fats and food particles that have built up inside your garbage disposal. That helps prevent clogs, and theÊlavender scent freshens your whole kitchen.